SocialStore is a US-based marketing company that focuses on enhancing the social media presence of any brand or person. It has services for Facebook, Twitter, Instagram, and YouTube. 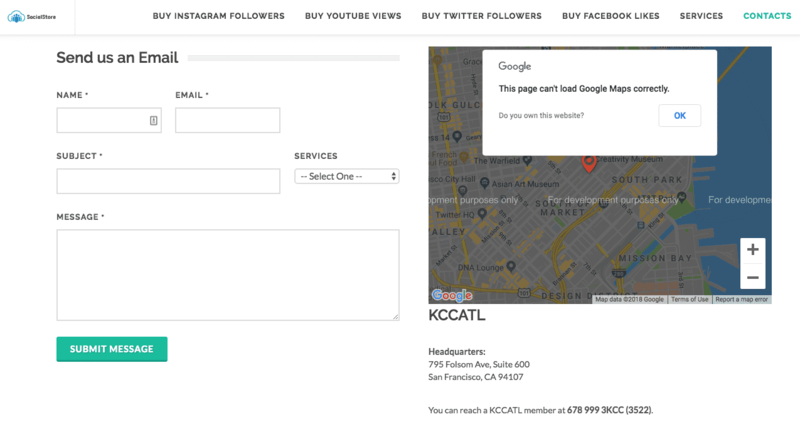 First off, the company’s website is confusing as it takes you to http://kccatl.com/ which turns out to be a childcare collective services company according to the old site link at the bottom of the homepage. Putting aside this information, the website serves its purpose quite simply. It shows the features and services that SocialStore offers. Ordering YouTube views is also very simple since all you have to do is select a service package and enter the URL of the video. You will then be redirected to the PayPal checkout page. SocialStore’s customer support can only be reached through the Contact Us page, while their terms of service cannot be found anywhere on the website. The fact that the website URL is owned by a childcare company and SocialStore didn’t even change it, creates confusion and even casts some doubt on the company. You can’t name a company SocialStore and leave the website in its previous owner’s URL. The site also doesn’t support HTTPS, making it even less secure and more unreliable. Their promised services are attractive since they can deliver up to one million real views, but try them at your own risk. Have you tried SocialStore’s service? What did you think of it? Let us know by giving a comment below.